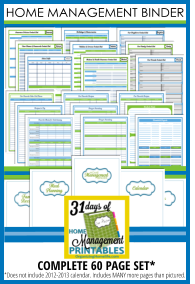 Welcome to Day 23 of our series on building your Home Management Binder. 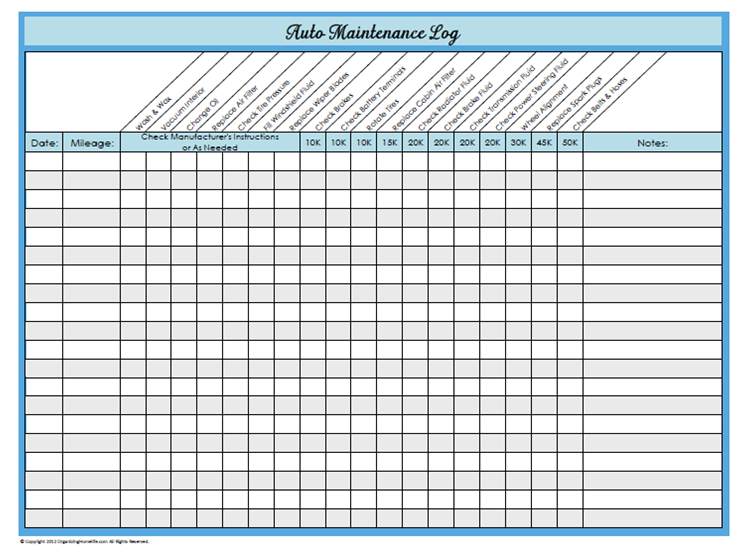 Today’s printable is a place to keep track of the maintenance you perform on your car. Keeping track of dates, mileage, and how often maintenance needs to be done can be somewhat cumbersome. The suggested times to perform maintenance on this printable are just that, suggestions. Please refer to your automobile’s owner manual for specific guidelines. Thank you so much girl!! I love it! I LOVE these! They are amazing 🙂 Thank you for posting them freely…that is wonderful. I was thinking, “she’s thought of everything!” But I did think of ONE more sheet to complete a home management binder: a pet sheet! Maybe Name, Vet info, Emergency Info, Allergies/Food Restrictions, Shot dates, dates flea meds/heartworm is due, etc…. If you make one, then I could have one to match all your other wonderful designs! 🙂 (and maybe I overlooked it and it already exists!) Thanks! I can’t figure out how to just download and print this one?? Is it not free anymore?